I have been in a slump in the kitchen lately. Some friends of ours are going through a tough time and it has hit me pretty hard. When you combine that along with the fact that the temperature is in the triple digits, any desire I might have to cook has been thrown out the window. Our refrigerator is overflowing with fresh veggies and fruits so most of our meals have been fairly easy and not so exciting to blog about. Although I must admit that my pasta last night was pretty delicious. (Orzo with fresh tomatoes, proscuitto, sautéed mushrooms, fresh mozzarella, and sautéed kale.) While the food has been good, it just didn’t seem that exciting. I did however find my sourdough starter in the fridge as I was trying to see what our options were for dinner so I decided to pull it out. Honestly, it wasn’t looking great but there was no mold on it so I searched online to see what to do to revive my dough. King Arthur Flour has an amazing chat feature on their website where you can ask questions of a baker and get instant answers (during normal business hours). It was awesome. The lady assured me my starter would be fine but to dump out half of it, feed the remainder and wait to see what happened. The starter started going crazy on my counter (thanks to the warm weather) and I was inspired to bake some bread. It wasn’t ready in time for supper to go with our pasta, but it was perfect for some picnic sandwiches the following evening. The bread is not quite as crispy on the outside as I would have liked though it is my best attempt thus far at homemade baguettes. (I didn’t use the egg wash, but will try that next time to see if it helps make them more crispy.) Regardless of the crispness of the bread it did help get me out of my funk and I am now more inspired to do some baking. Nothing like getting out your frustrations and anger by kneading some dough. It does the soul good. *If you feed your sourdough before using, the loaves will rise better; but if you’re in a hurry, unfed sourdough will simply lend its flavor, while the yeast in the recipe takes care of the rise. In a large bowl, combine the water, starter, and 3 cups of the flour, mixing until smooth. 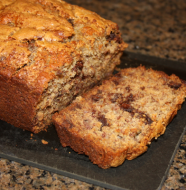 Stir in the salt, sugar, yeast and gluten, then an additional 1 1/2 to 2 cups of flour. (I only used 4 1/2 cups flour for my dough. You want it to be stickier than drier.) Stir until the dough pulls away from the sides of the bowl, adding only enough additional flour as necessary. Knead the dough for about 7 minutes in a stand mixer; or 8 to 10 minutes by hand, on a lightly greased work surface. When finished kneading, transfer the dough to a large oiled bowl. Cover and let the dough rise until doubled in bulk, about an hour and a half. Once the dough has doubled in bulk, gently deflate the dough, and divide it into six pieces (for thin baguettes) or three pieces (for thicker Italian loaves). Cover the loaves with lightly greased plastic wrap, and let them rise for 1 1/2 to 2 hours, or until they’re nice and puffy. Towards the end of the rising time, preheat your oven to 450°F. If desired, gently brush the loaves with egg yolk glaze, and sprinkle them generously with Pizza Seasoning, artisan bread topping, or the toppings of your choice. If you’re not brushing the loaves with egg yolk, spray them with olive oil spray; this will help them brown. 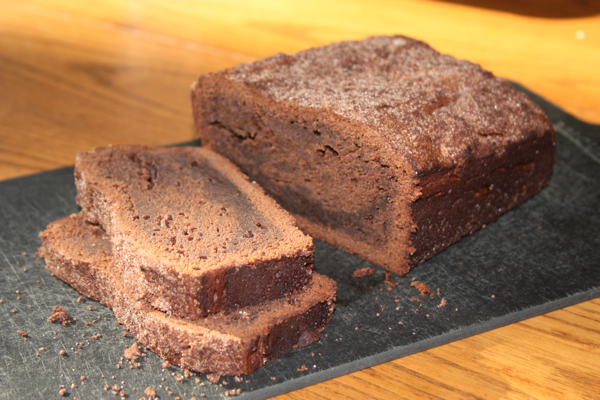 *For a classic look, make three diagonal slashes in each loaf, cutting about 1/4″ deep. For taller, rounder baguettes, don’t slash. 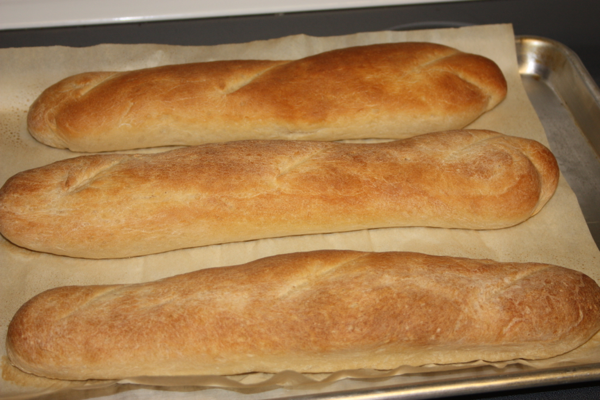 Bake the baguettes for about 20-25 minutes, or until they’re a rich golden brown. Remove the loaves from the oven. 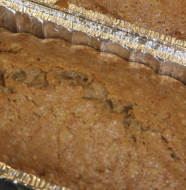 Turn off the oven, crack it open a few inches, and return the loaves to the cooling oven, without their pans. Letting the loaves cool right in the turned-off oven helps preserve their crunchy crust. 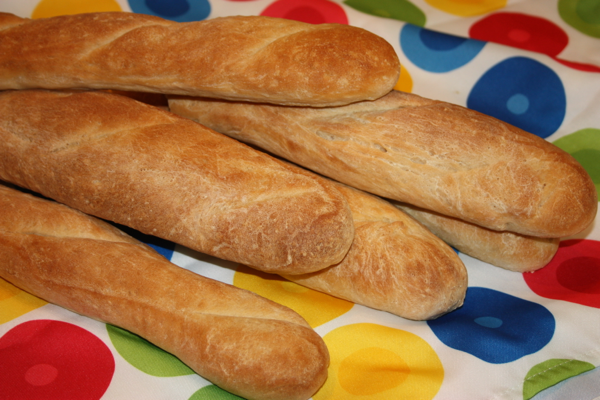 Yield: 6 baguettes or 3 Italian-style loaves. 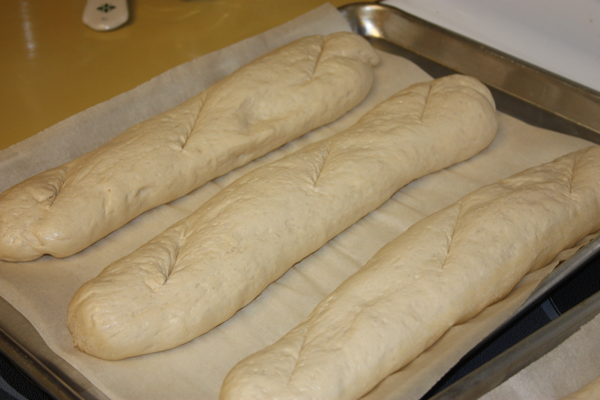 Baguettes ready to go into the oven. Nothing like the smell of bread fresh out of the oven. One Comment on "Sourdough Baguettes"